I first heard of Mashiko from a friend of mine who interviewed Chef Hajime for an article on sustainability and the environment as that is her field of profession. It didn't necessarily have to do with the food aspect of the restaurant but it did touch on the sourcing of their ingredients. While that isn't exactly what Much Ado About Fooding is about, it does play a part in how the food tastes when it is brought out to the customer. So I put it on my mental hit list of places to visit once we ever made it up to Seattle and not too long ago, we did. Our visit there was not under a reservation as so many people have suggested since we weren't sure which night we'd visit but luckily, they had a space for us right at the end of the bar so we could see all of the action. We decided we'd go opt for one of their omakase options that evening. "Rule #18: Soy sauce is not a beverage." Mashiko faces street-side so good luck finding parking there in the busy lane. You'll have a better chance in the back lot where parking is free after a certain hour. 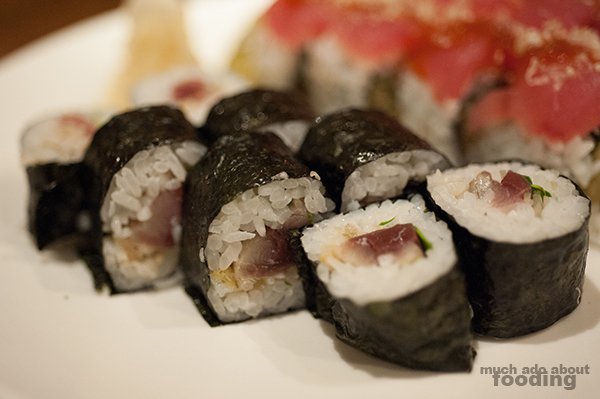 It might be fitting for a late night sushi craving. We walked around to the front where the neon namesake light greeted us and upon entering, saw just how busy the whole restaurant was. There were several sarcastic little signs near the entrance and by the counter as well as cheeky buttons for the taking. Though we didn't have a reservation, something cleared up soon at the counter so we were swiftly seated to watch the chefs at work. The perk of looking like a tourist (since we were out of town) was that having a camera for the food shots wasn't out of the ordinary. Throughout the night, the service was excellent despite the bustle of every seat being full all the time. We never felt rushed and knowing that our dishes would come from a marine enthusiast with attention to sourcing was even better. As newbies to the restaurant, we decided to leave it in the chef's hands. 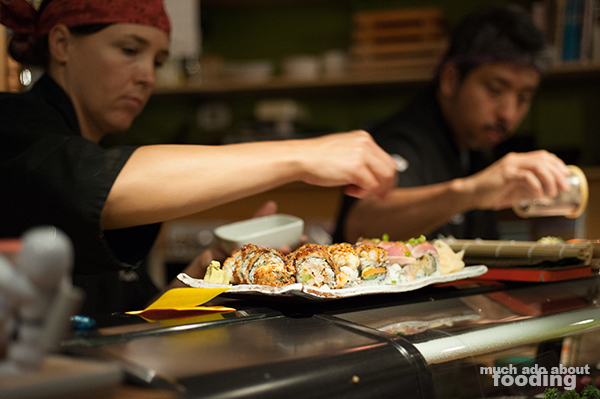 There are several omakase options on their menu. Since it was our second dinner that night, we just went with the Umi ($60 for two people - miso soup, two sashimi appetizers, eight pieces of nigiri, two rolls, and one dessert). 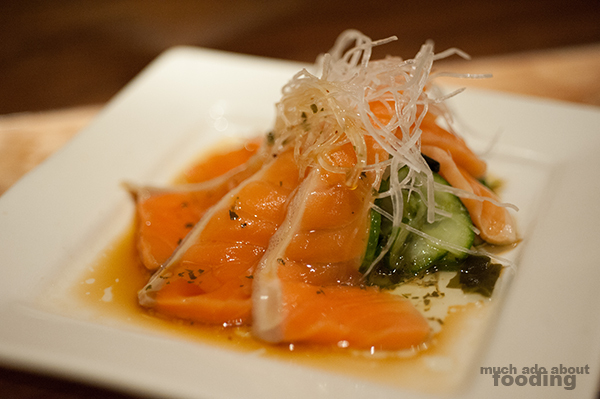 The first sashimi appetizer was a buttery, smooth salmon plate with a solid sauce and the second, melt-in-your-mouth pieces were accentuated with sesame seeds, sesame oil, and a seaweed salad. It seemed to us that many of those in the restaurant were regulars to Mashiko from the conversations they were having with each other as well as with the chefs. There were only two working on sushi for the whole place while we were having dinner so it was impressive how they speedily prepared everything while having time to converse with the regulars. 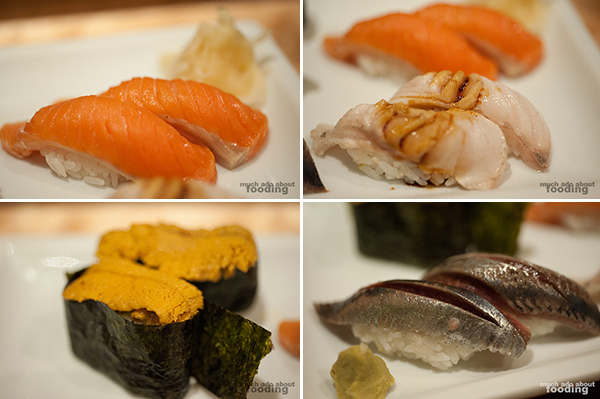 Our nigiri pieces were of fatty, rich salmon, one I honestly cannot remember, uni, and mackerel. The uni was quite fresh and tasted of the sea instead of fishy as some places tend to have of their uni. It was also very sizable for what it was. The mackerel seemed to be a common fish as we saw it again later in one of our rolls; for the nigiri, the fish smelled strongly of the iconic mackerel scent. 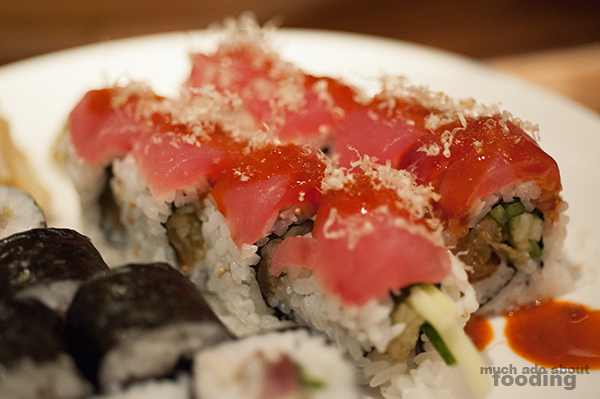 The roll was a tad lackluster but the following tuna roll was great. On the menu, there is definitely a separation between traditional rolls and what they label as "American Style Rolls" so that a variety of customers can still enjoy Mashiko. Overall, we were quite happy with the options we received for the omakase. Were we wowed? Not exactly but it was still a satisfying meal and great atmosphere. 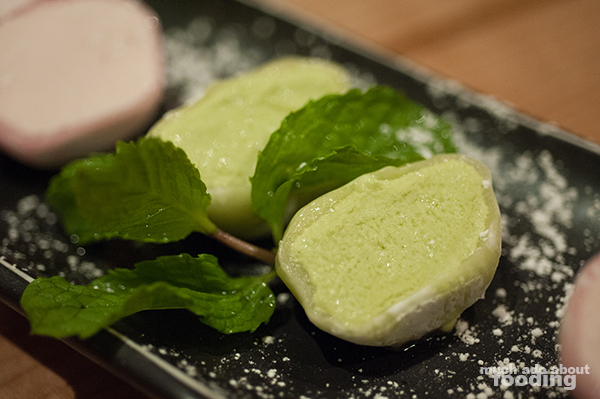 The dessert along with the omakase selection was two flavors of ice cream mochi - strawberry and green tea. I've always enjoyed these morsels from wherever I've gotten them so this was a welcome treat. 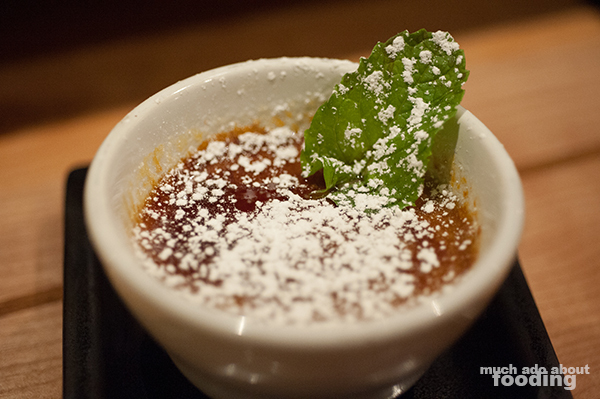 I also ordered an additional Jasmine Creme Brulee ($6) because I hadn't seen it offered anywhere else before. 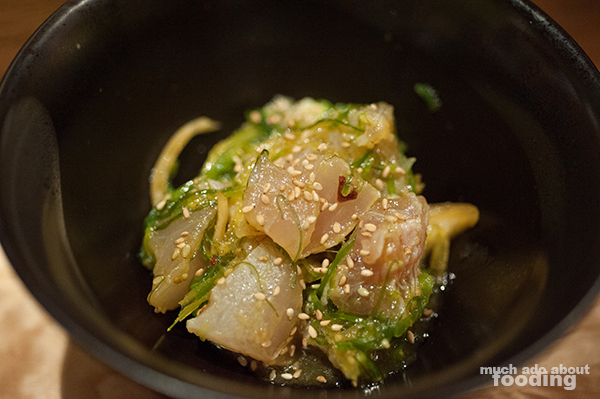 The jasmine flavor was heavy on this one, a quality I really liked, and the whole dish was not overly sweet. Creamy and smooth, the creme beneath the hardened sugar on top was pleasantly thick and done well. 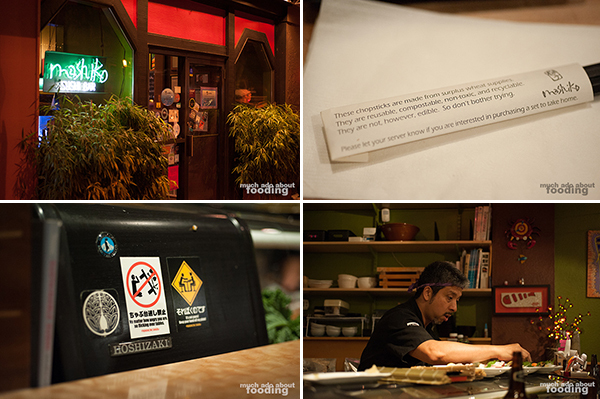 Overall, our experience at Mashiko was a good one that we could leave from with a good conscience in tow.